Heads Up Display. Our Unified Communications Solution. Unified communications (UC) may not be a household term, but it's becoming an essential element in business productivity. UC refers to software that bring together a bunch of communication and collaboration tools into a unified experience. UC gives you one place to connect with everyone in your company as well as with your customers and suppliers. 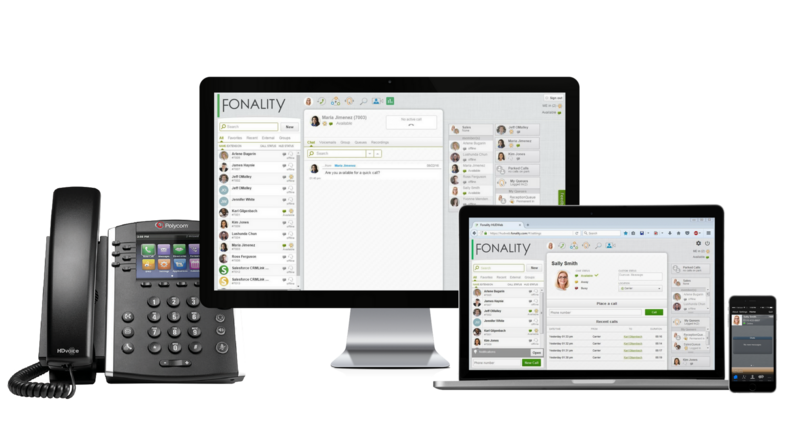 With our unified communications solution from Fonality, Heads Up DisplayTM, your employees can manage phone calls, voicemail, instant messaging (IM), conference calls, email, screen sharing, video conferences, and even see who's at their desk or on the phone (known as "presence") on one screen. That makes it easy to connect quickly and easily with the right people at the right time, from any location or device. Fonality provides the communication tools to improve internal communications company-wide and save employees up to 2 hours a day in wasted productivity. Heads Up DisplayTM helps employees be more efficient and effective, making it easier for them to select the best way to initiate, receive, and respond to business communications. Heads Up DisplayTM is all about collaboration, boosting productivity, improving customer service, and enabling employees to work smarter. Here are just a few of the many features in our unified communications tool. Communicate in seconds, sending instant messages to anyone in your company. Answer a call, join a conference, transfer, park, place a call on hold, or send to voicemail with a simple mouse click. Email anyone in your company with one click; access their contact information to create an email message with pre-populated contact information. Retrieve and review voicemail from any phone or 1-touch from your desktop. Even get your voicemail transcribed via email or text. Real-time screen sharing tool for conferences and sales presentations, without third party software. Communicate no matter where you are on the device of your choice (PC, tablet, smartphone, laptop). Host on-demand conference calls with features like conference recording and add or remove participants. The Heads Up Display dashboard unifies the tools you need for daily communication and collaboration. Your entire team will stay connected, productive and responsive. Chat with one of our collaboration experts today for a first hand look.